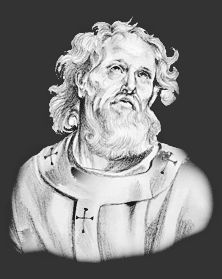 The story and history of Saint Felix of Valois. Saint Felix was son of the Count of Valois. His mother throughout his youth did all she could to cultivate in him a spirit of charity. The unjust divorce between his parents matured a long-formed resolution of leaving the world; and, confiding his mother to her pious brother, Thibault, Count of Champagne, he took the Cistercian habit at Clairvaux. His rare virtues drew on him such admiration that, with St. Bernard's consent, he fled to Italy, where he led an austere life with an aged hermit. At this time he was ordained priest, and his old counsellor having died, he returned to France, and for many years lived as a solitary at Cerfroid. Here God inspired him with the desire of founding an Order for the redemption of Christian captives, and moved St. John of Matha, then a youth, to conceive a similar wish. Together they drew up the rules of the Order of the Holy Trinity. Many disciples gathered round them; and, seeing that the time had come for further action, the two Saints made a pilgrimage to Rome to obtain the confirmation of the Order from Innocent III. Their prayer was granted, and the last fifteen, years of Felix's long life were spent in organizing and developing his rapidly increasing foundations. He died in 1213. The Feast Day of Saint Felix of Valois is November 20. The origin of Feast Days: most saints have specially designated feast days and are associated with a specific day of the year and these are referred to as the saint's feast day. The feast days first arose from the very early Christian custom of the annual commemoration of martyrs on the dates of their deaths at the same time celebrating their birth into heaven.